Can't decide between a cross and an ichthus to represent what you believe to the world? Now you don't have to! These unique earrings incorporate both to create a pair that's unlike any other. From the side, a simple ichthus (the "Christian fish") is clearly visible, but when these earrings are viewed straight on they become modern crosses with a clean cutout taken from each one. Either design would be sufficiently eye-catching on its own, but together these two motifs form a powerhouse style with an element of surprise. Crafted from top-quality .925 sterling silver, this pair is a versatile and meaningful accent. Earrings measure 19mm x 13mm. 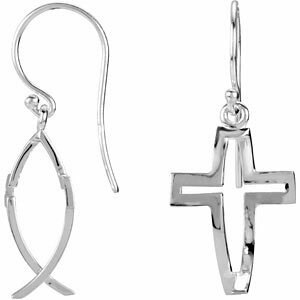 We guarantee our Crossfish Earrings, Sterling Silver to be high quality, authentic jewelry, as described above.